"We have the summer short term mission groups coming and repainting houses and playing with our children . . . I think there are some pros and cons when it comes to the groups that roll around in the big buses and white vans . . . a safari type mentality . . . come to check out the poverty. . . Most of the groups are here to try to help our people, but the (Mission/Tour Companies) control what they do and see on the Reservations" (June 5, 2014). 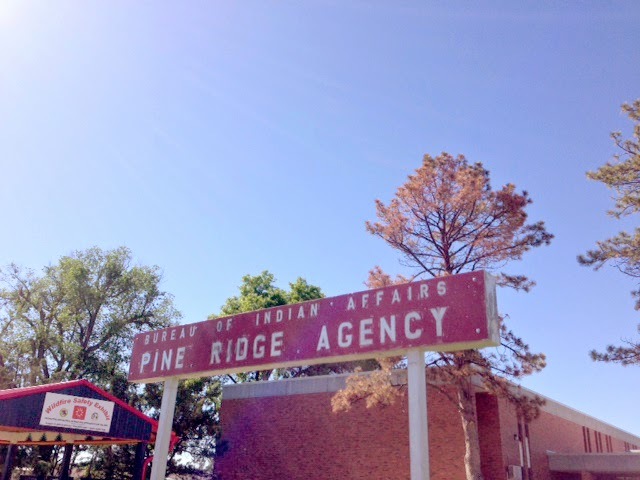 Matthews' comments are exactly why I hesitated to go to Pine Ridge. I did not want to go there to change or interrupt/disrupt anyone there. I especially did not want to be a part of any "safari mentality." Years ago, I was invited to Africa, and too many times during that trip, I felt much like the kind of "wasicu" Leon Matthews describes above. "Wasicu," is a Lakota word with many meanings two of which are "one who is not native" and "one who takes" ("Wasicu": pronounced wa-shee-koo). 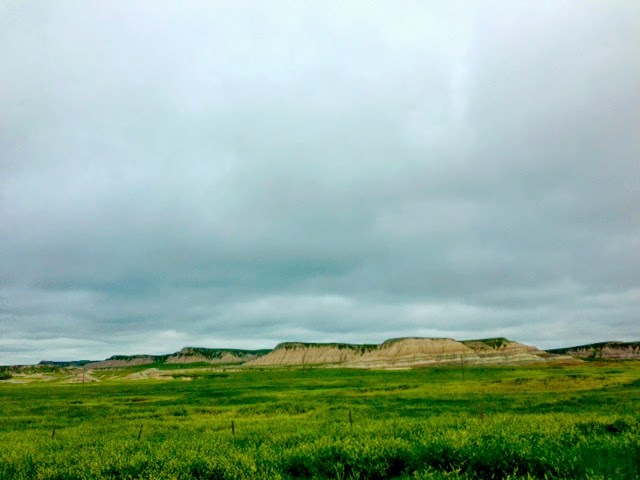 I have read and heard about some of the "mission" or volunteer groups who, without asking or listening to people, or understanding their needs, they barrel in and "take charge," painting a Lakota family's house without even asking if they would like their house painted in the first place, and/or painting the house a color the family never approved. Now that I'm here, we were told of a family's house getting painted every summer. The family just paints it back to the original color. 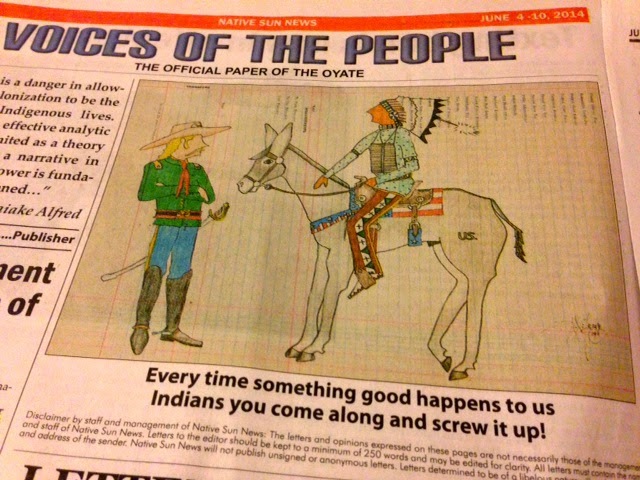 I think of Leonard Peltier's Prison Writings where he talks of "junk cars in some Indian family's front yard" and the outsiders (tourists/mission people) who interpret this as just another sign of poverty by saying, "These dirty Indians, how can they live like that..."
Peltier brilliantly continues in this very short section: "Maybe these people, so quick to judge, don't understand the higher mathematics of being poor. They don't realize that, when you can't afford to buy or commercially repair a car, it may take six or eight junkers out in the yard to keep one junker going on the road. Those yard junkers take on a special value in Indian eyes: they're the source of that hard-to-come-by and almost sacred commodity in Indian country--transportation. 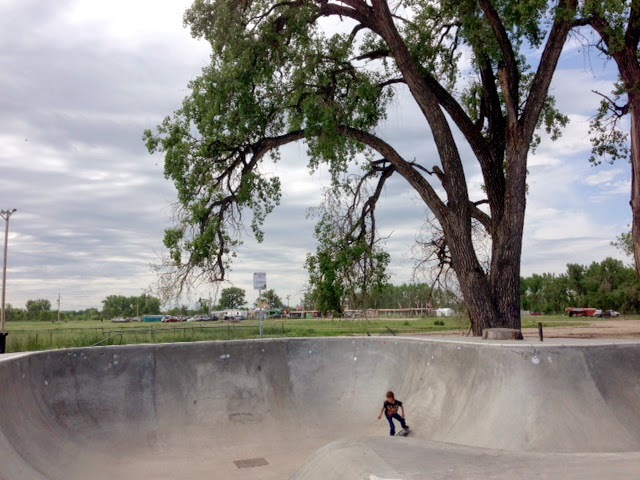 Without wheels out in the empty distances of the rez, you're utterly isolated. When the family's one working car breaks down, one of those yard junkers may provide precisely the part that's needed so that Pop can drive seventy miles to town each day to his menial job and help feed his often-hungry family. To such a family, those junkers out in the yard represent survival. So why am I here? I was invited. But even with the invitation, I hesitated. I wanted to make sure the reason to come here was an ethical one. As you know, Queridos "La Bloga" readers, I've been writing and researching on Diabetes. Our Latino people are impacted by Diabetes as much as indigenous populations on both sides of the border. 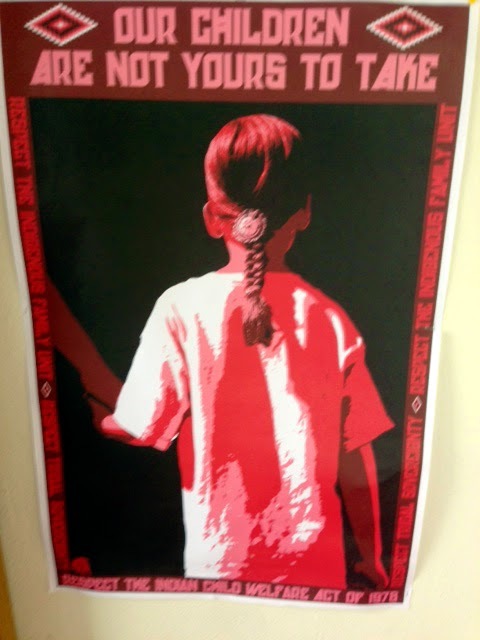 I am here, then, to witness, understand, and learn, how Lakota people are managing the disease. 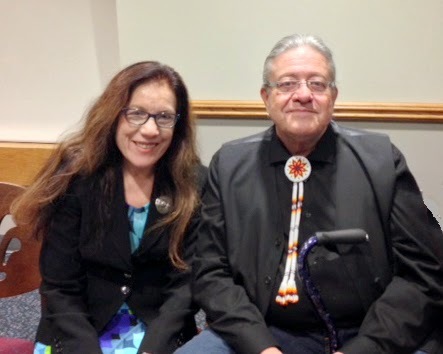 In this whirlwind week, I've met with Lakota President Bryan Brewer and with Toni Red Cloud, who is one of President Brewer's assistants, and also Tuki Tibbits, the Director of a Diabetes Prevention Center, "Oyate Blihelya" ("That the People May Live"). Currently, the Diabetes Center is working to transform their grassy grounds (surrounding their offices) into vegetable gardens for the people, to provide bicycles and organized bike rides, as well as other exercise programs. 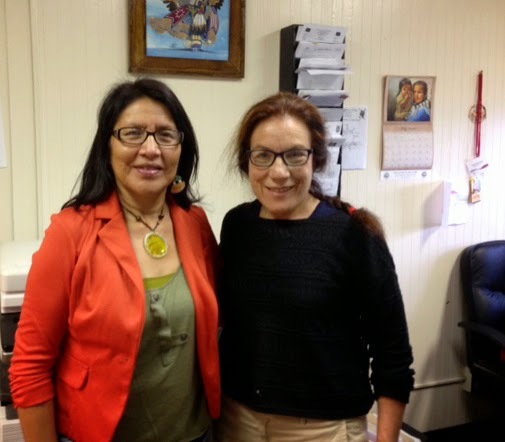 They are also going to the schools and Lakota owned grocery stores to consult on the kinds of foods to provide. Tuki Tibbits noted how we asked how we could be of use to them, how we could help their efforts. She said that organizations or school groups will come to hear what they are doing, and then they leave. Tuki never hears from them again. Our commitment is to continue this contact and help to support them in the way they see works for their "Oyate Blihelya" Center. Their strategies also helped me understand the vast work to be done back home where I am in Lincoln, Nebraska, as well as when I think of mi familia and Chicana/Chicano and Latina/Latino communities. 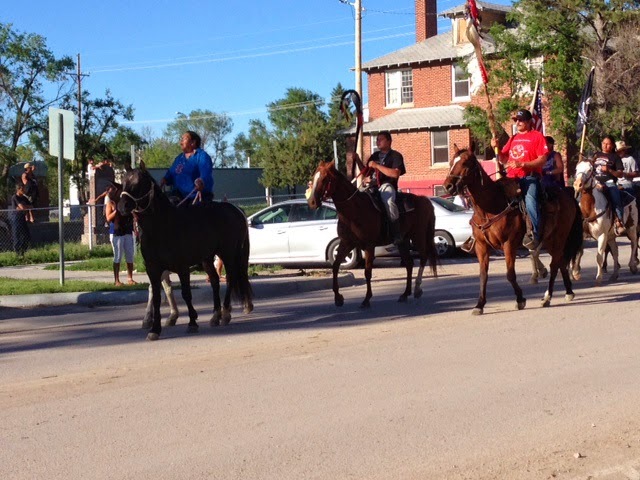 And after our session learning and witnessing Lakota strategies on Diabetes, our group stood on Main Street with other guests and locals to witness the over 200 Lakotas on horseback returning from a four-day trip they began at Fort Robinson. It's called "The Crazy Horse Ride." 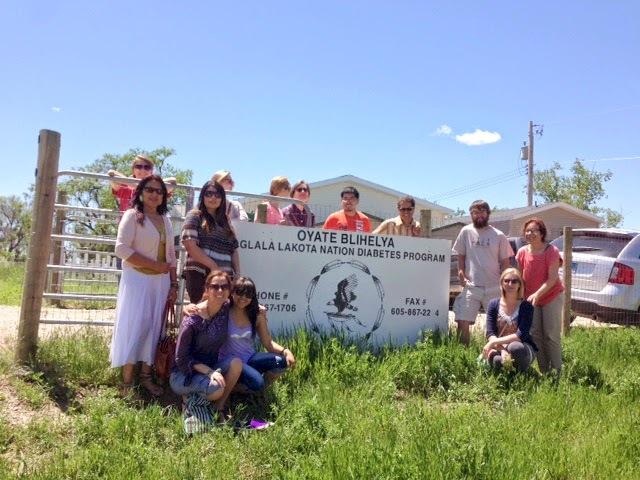 It is an annual youth development ride to teach Lakota youth about The history of Crazy Horse, the Lakota culture, sacred rituals. They return with the spirit of Crazy Horse, illustrated by arriving with a riderless horse at the front of the long line of riders (see pictures below). 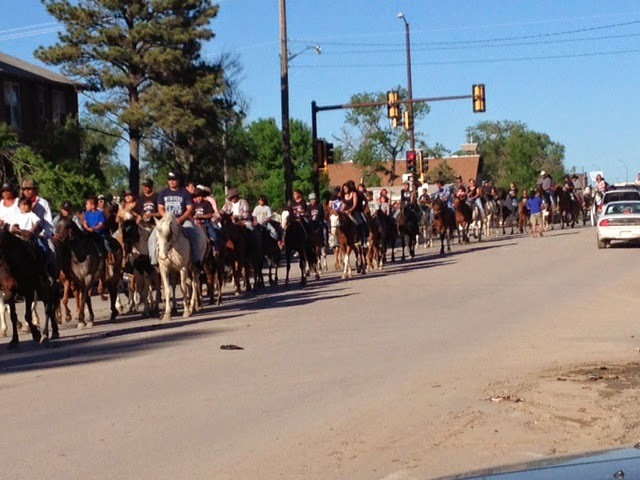 It was a most moving moment to see children, teens, young adults, (and adult leaders), female and male, proudly riding past us on ponies, palominos, pintos--all ages, sizes. It was breathtaking. The Indigenous Tribes of North America are not gone. They ride and stand strong, and I feel humbled and honored to be here to witness, to learn. The meaning of the ride is about the final journey of Crazy Horse. 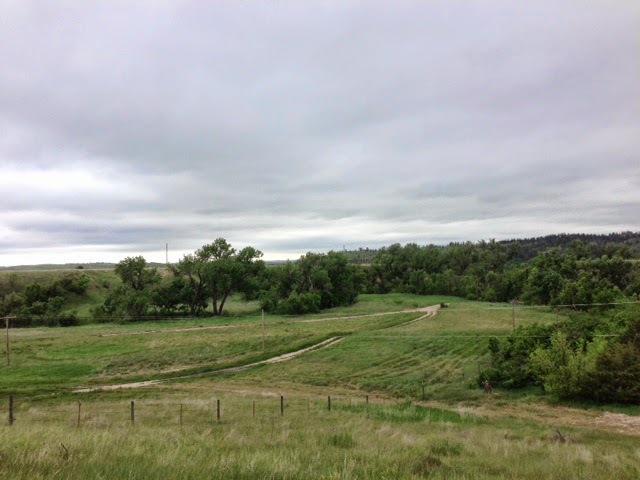 The areas of Fort Robinson and Beaver Valley were significant to the final days of the Lakota leader. The riderless horse symbolizes a warrior and his spirit that resides within the Great Lakota Nation. 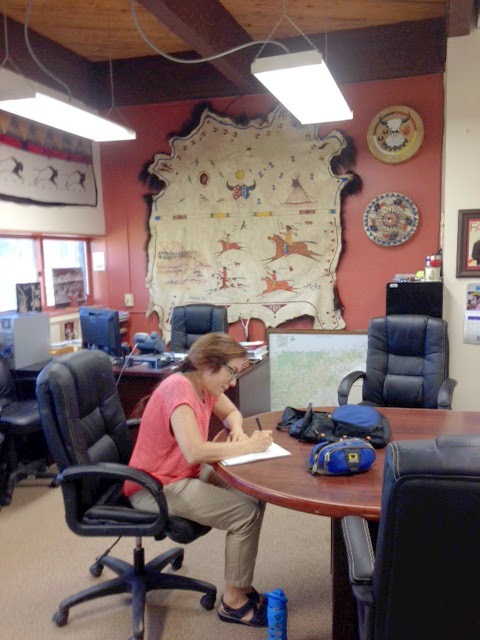 Writing in President Brewer's office. 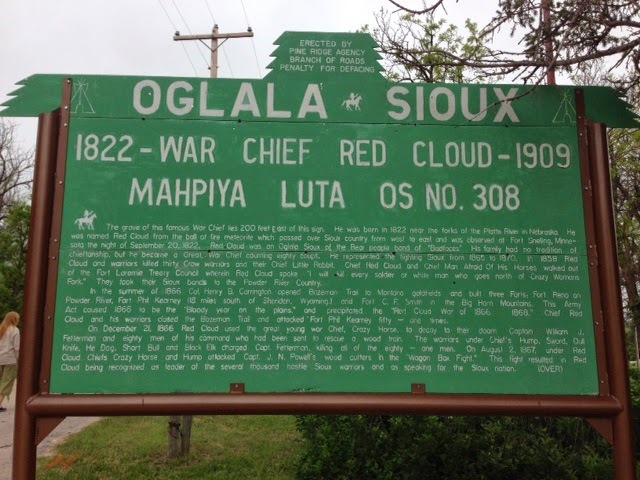 As well, in my group with whom I am traveling, (I have come with other Chicanos and Latinos), they, like me, see so many cultural connections with the Lakota. We've been having many talks about our own mestizaje, our own experiences as minorities in this country. More to write, of course. But, for now, I wanted to share just a bit of this experience contigo. To be continued! Amelia, thank you for this very enlightening post! The pictures are beautiful. I especially appreciated the note on the cars in the yard. I look forward to your next update! I love how the author navigates her discomfort and ours, with "safari mentality." Beautifully done. A beautiful Ledger art hide in the office! I wonder if it's old? 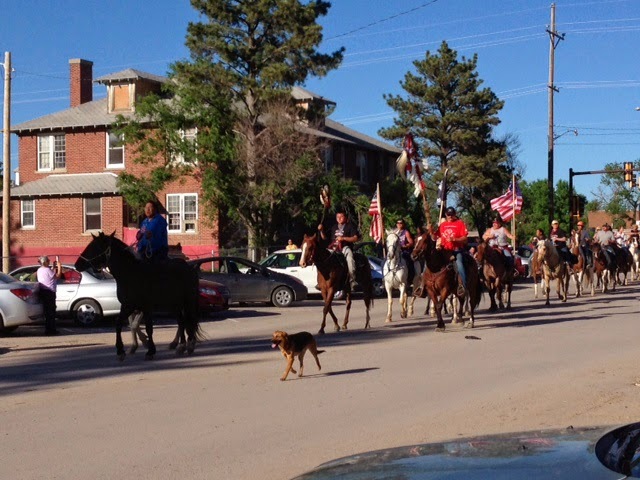 It great that the Lakota own so many horses, maybe they won't need bikes to remain active. Thanks for your post, we are waiting more!